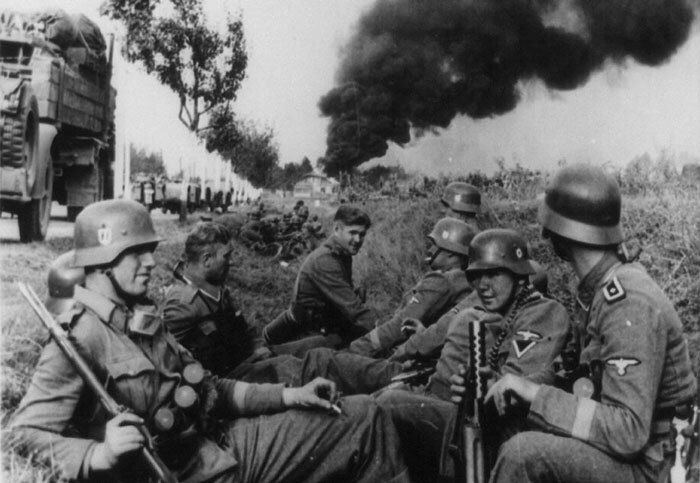 Nazi troops shocked the entire world by invading Poland on September 1, 1939. World leaders recognized this as the final straw that would lead to war. Actually, German military leaders had been planning for war with Poland as early as 1920s. The rise to power of Hitler in 1933 capitalized on German’s desire to regain lost territories. Historian Alexander Rossino wrote that prior to the war Hitler was at least as anti-Polish as anti-Semitic in his opinions. When Hitler violated the Munich treaty, Poland was able to gain military assistance from France and Britain. 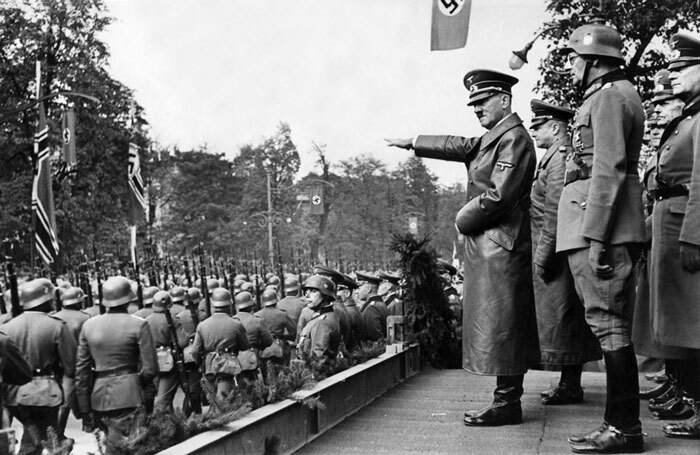 In March 1939, Hitler began to make demands on Poland for the return of territory in the Polish Corridor, cessation of Polish rights in Danzig, and annexation of the Free City to Germany. In which, Poland rejected. The war was getting closer. The Polish army still maintained many cavalry squadrons, which had served them well during the Polish-Soviet War in 1921. A myth emerged about the Polish cavalry leading desperate charges against the tanks of the invading Nazis, pitting horsemen against armored vehicles. 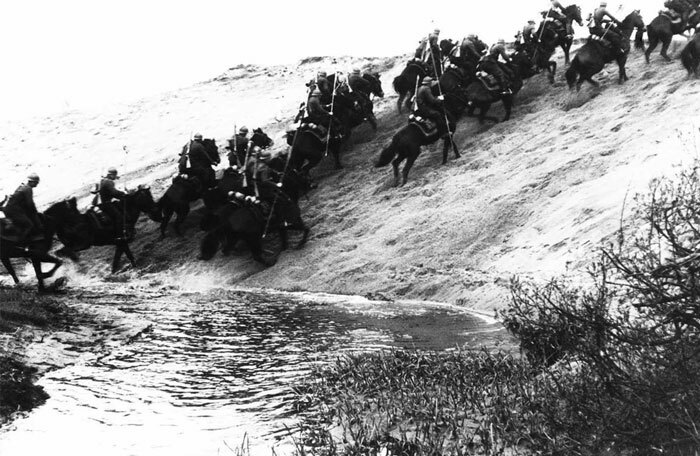 Below is a Polish cavalry squadron on maneuvers somewhere in Poland, on April 29, 1939. Poland’s full mobilized army during this time was estimated around 2.5 million. But due to allied pressure and mismanagement, only about 600,000 Polish troops were in place to meet the German invasion. Poland forces were divided into 7 armies and 5 independent operational groups. Bu they were weaker in terms of anti-tank guns, artillery support, and transport. There were 12 cavalry brigades and one mechanized cavalry brigade. In contrast, the Nazi forces comprised of two Army Groups, with a total of 5 armies. The Nazis fielded about 1.8 million troops. The Germans had 2600 tanks against the Polish 180, and over 2,000 aircraft against the Polish 420. In addition, German forces were supplemented by a Slovak brigade. 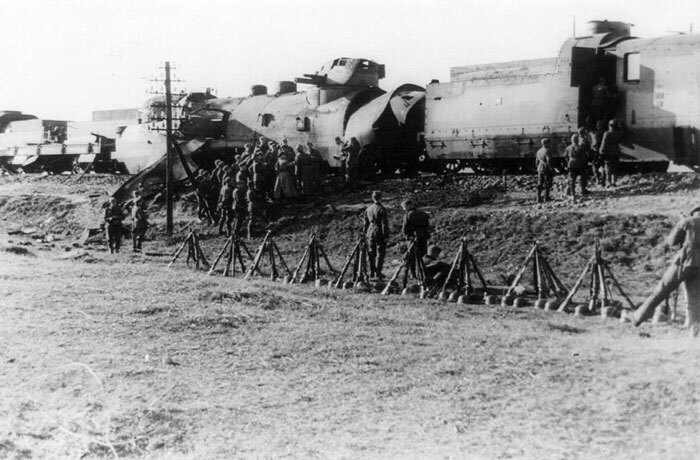 German forces invaded Poland from the north, south, and west the morning after the Gleiwitz incident. 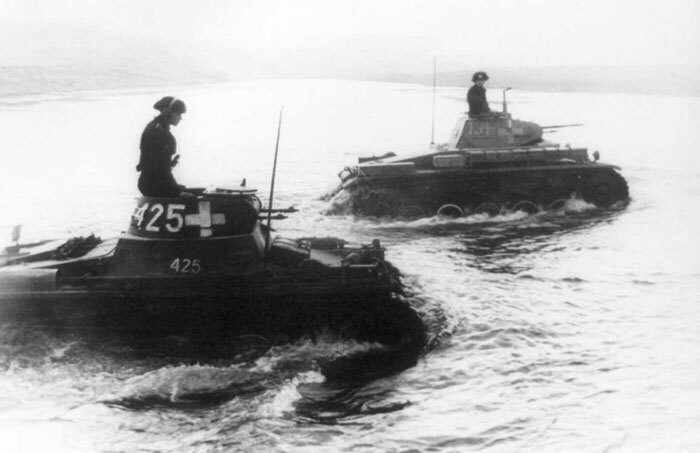 Slovak forces advanced alongside the Germans in northern Slovakia. As the Wehrmacht advanced, Polish forces withdrew from their forward bases of operation close to the Polish–German border to more established lines of defense to the east. The Polish defeat in the Battle of the Bzura in September gave the Germans undisputed advantage. The Polish forces withdrew to the southeast where they prepared for a long defense of the Romanian Bridgehead, awaiting support and relief from France and United Kingdom. While both countries had pacts with Poland, their aid to Poland was very limited. In October, the Polish forces were again defeated at the Battle of Kock, German and Soviet forces gained full control over Poland. The success of the invasion marked the end of the Second Polish Republic. Poland never formally surrendered. 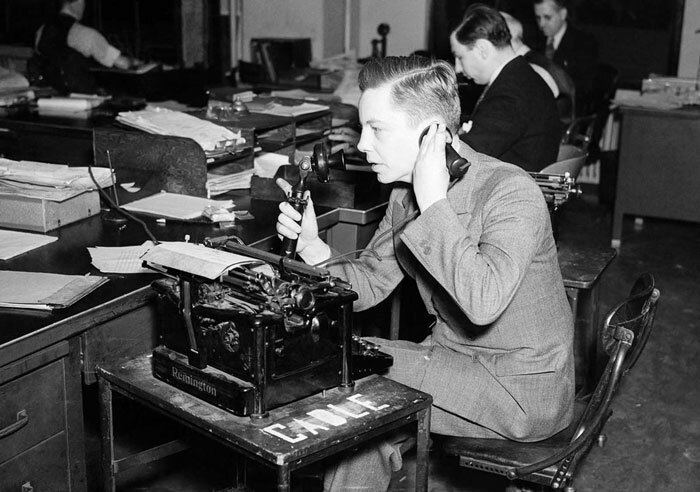 Associated Press correspondent Alvin Steinkopf broadcasting from the Free City of Danzig. Steinkopf was relating the tense situation in Danzig back to America in 1939. In December 1939, the American journalist John Gunther wrote that “the German campaign was a masterpiece. Nothing quite like it has been seen in military history”. Gunther claimed that the invasion proved the skill of the German forces. Slovakia gained back the territories taken by Poland in autumn 1938. Lithuania received the city of Vilnius and its environs on 28 October 1939 from the Soviet Union. About 65,000 Polish troops were killed, with 420,000 others being captured by Germans and 240,000 more by the Soviets (for a total of 660,000 prisoners). 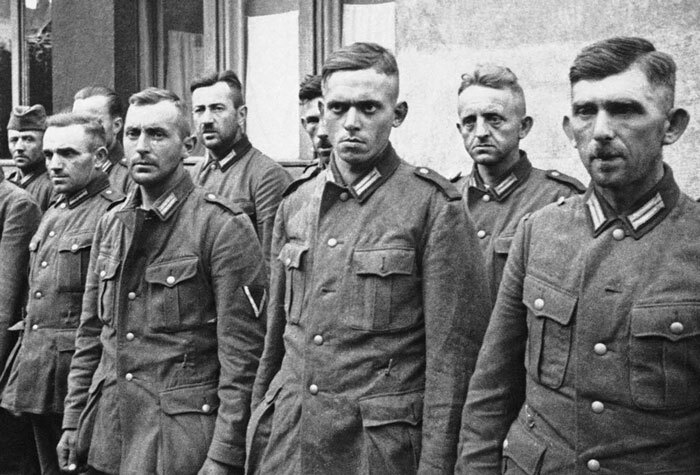 German army losses were less than their enemies, estimated around 16,000 killed). 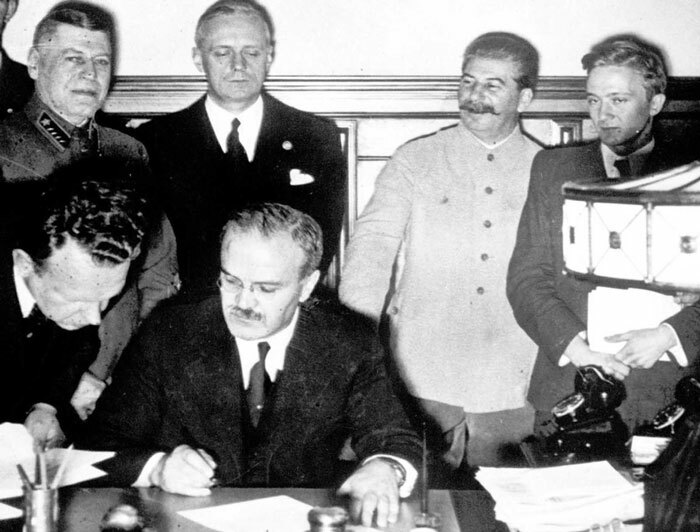 Soviet premier Josef Stalin smiling while Soviet Foreign Minister Vyacheslav Molotov (seated), signs the non-aggression pact with German Reich Foreign Minister Joachim von Ribbentrop (third from right), in Moscow, on August 23, 1939. The man at left is Soviet Deputy Defense Minister and Chief of the General Staff, Marshal Boris Shaposhnikov. The nonaggression pact included a secret protocol dividing eastern Europe into spheres of influence in the event of a conflict. 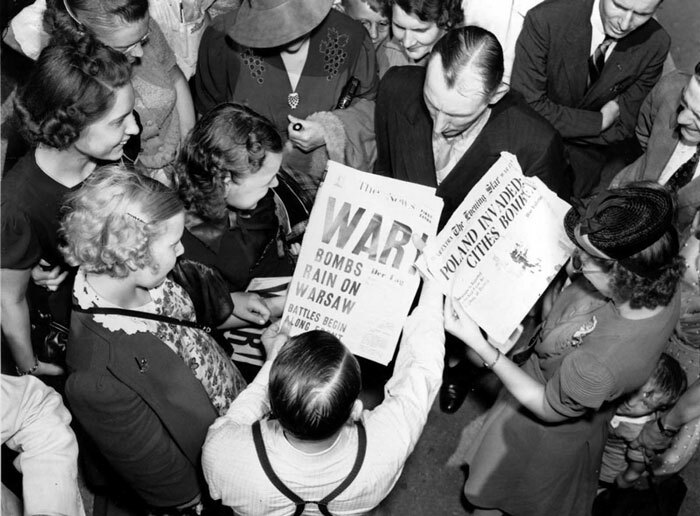 The pact now guaranteed that Hitler’s troops would face no resistance from the Soviets if they invaded Poland, bringing the war one step closer to reality. 2 days after Germany signed the pact, Great Britain entered into a military alliance with Poland. Below is the scene 1 week later, in which one of the first military operations of Germany’s invasion of Poland, and the beginning of World War II. 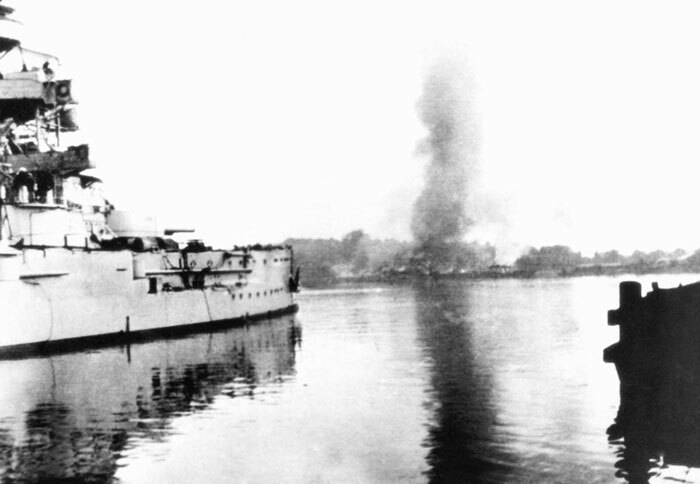 Here, the German battleship Schleswig-Holstein is bombing a Polish military transit depot at Westerplatte in the Free City of Danzig. 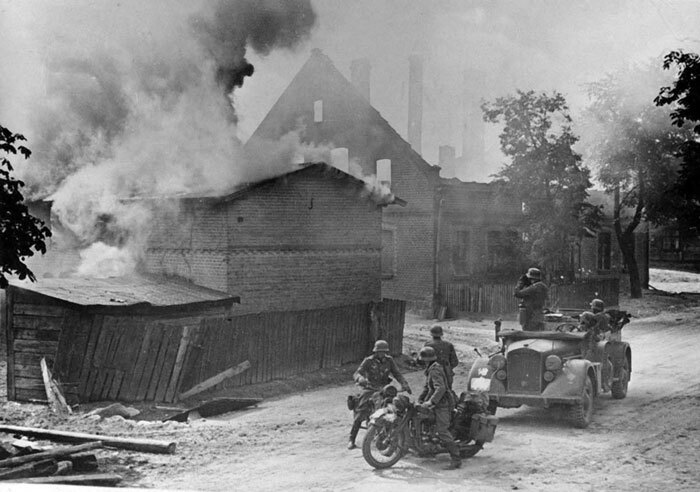 Simultaneously, the German Air Force (Luftwaffe), and ground troops (Heer) were attacking several other Polish targets. 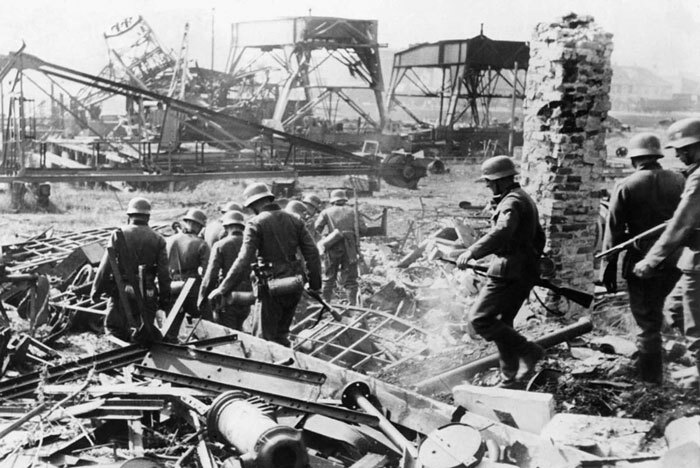 German soldiers comb the Westerplatte after it was surrendered to German units from the Schleswig-Holstein landing crew, on September 7, 1939. Fewer than 200 Polish soldiers defended the small peninsula, holding off the Germans for 7 days. 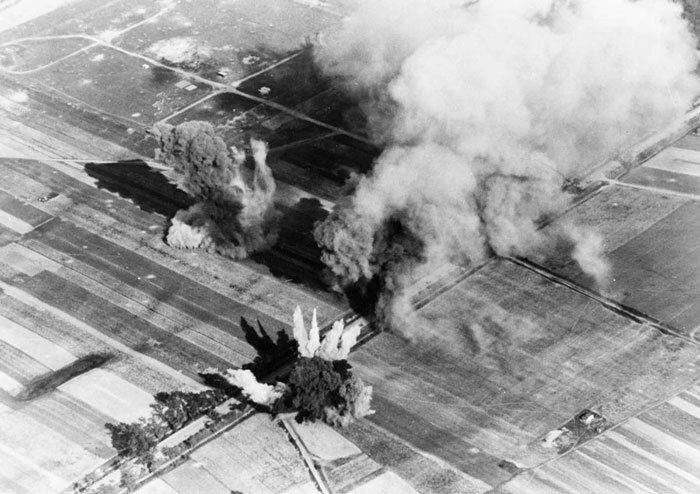 Aerial view of bombs exploding during German bombing run over Poland in September of 1939. 2 tanks of the SS-Leibstandarte Adolf Hitler Division cross the Bzura River during the German invasion of Poland in September of 1939. The Battle of Bzura, the largest of the entire campaign, lasted more than a week, ending with the German forces capturing most of western Poland. 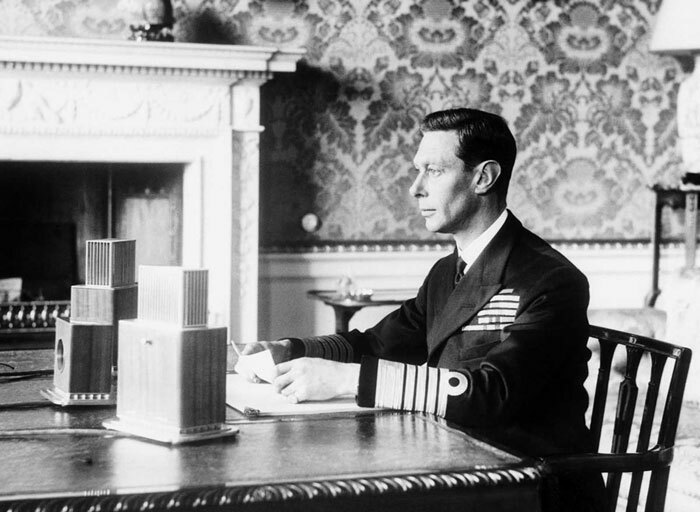 Britain’s King George VI broadcasting to the British nation on the first evening of the war in London. 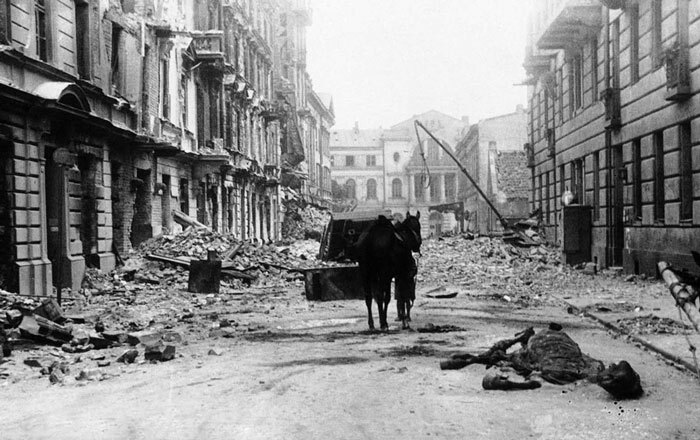 Devastation seen on Ordynacka Street in Warsaw (1940). The carcass of a dead horse lies in the street among enormous piles of debris. 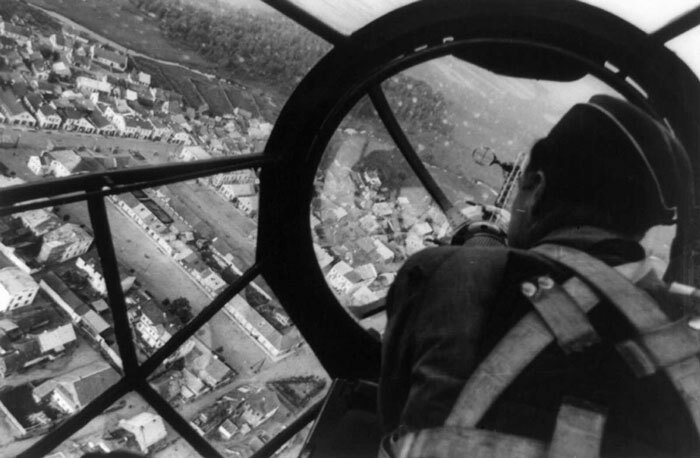 While Warsaw was under nearly constant bombardment during the invasion, on one day alone about 1,150 bombing sorties were flown by German aircraft against Warsaw, dropping over 550 tons of high explosive and incendiary bombs. 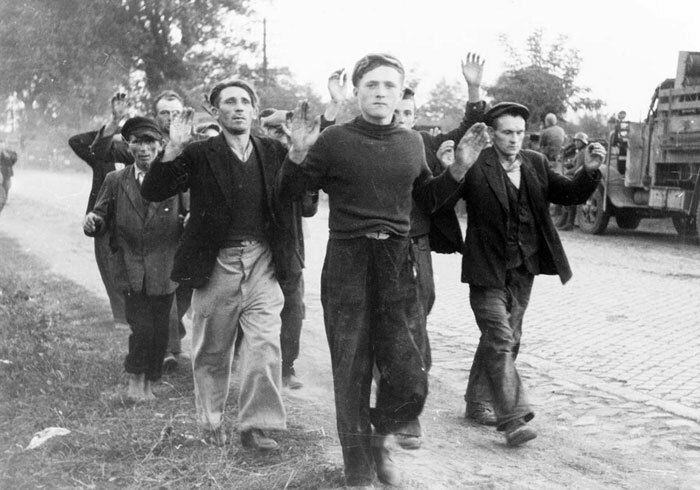 German soldiers, taken prisoner by the Polish army during the Nazi invasion, are shown while they were held captive in Warsaw, on October 2, 1939. 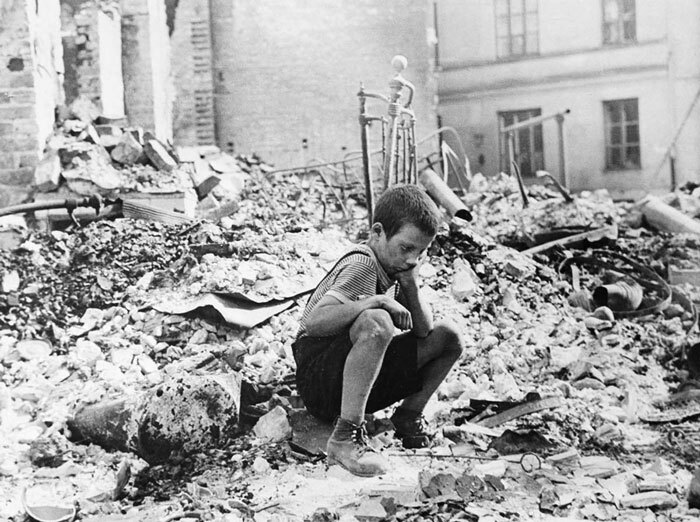 Young Polish boy returns to what was his home and squats among the ruins during a pause in the German air raids on Warsaw. 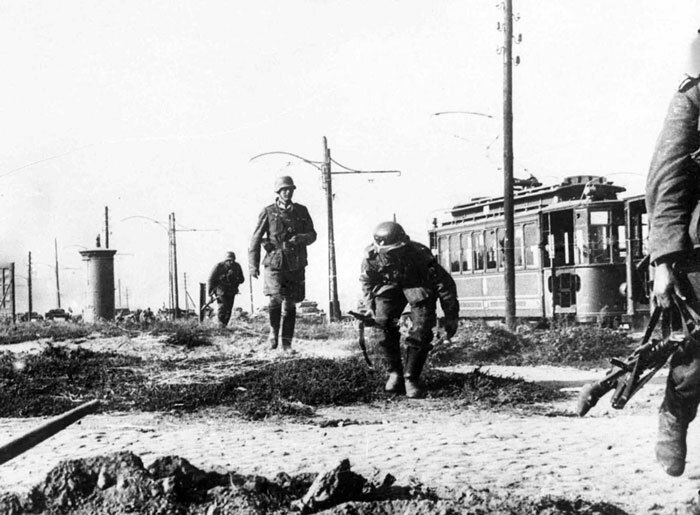 German attacks lasted until Warsaw surrendered on September 28. One week later, the last of the Polish forces capitulated near Lublin, giving full control of Poland to Germany and the Soviet Union.